Thinking About Dental Implants in Wethersfield? Start Here! If you’re one of the 178 million Americans with missing teeth, it goes without saying that you want a replacement option that looks and feels as natural as possible. Unfortunately, although dentures may restore the appearance of your smile they don’t always function as well as you may like. The good news is that there are modern options like dental implants in Wethersfield than can last decades, if not a lifetime! But even if you’ve already decided that implants are for you, what can you expect from the procedure? In this blog, we’ll answer that question and review the basics of the implant process, including cost estimates and additional considerations that may be specific to you. What Can You Expect From Getting an Implant? Many people find that getting an implant is far easier than they initially expected. The first phase is placing the implant itself in the jaw, which is actually a surgical-grade titanium post that acts as the “root” of your new tooth. Your dentist will start by making sure you’re numb and completely comfortable. Many people report that this isn’t any more difficult than getting a simple filling. Next, the post will be given 3-6 months to fully integrate, or fuse, with your existing jawbone. 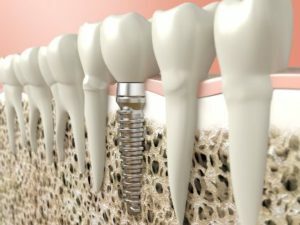 This is what will give the implant the strength and stability that helps it feel like your own tooth. The final step is to secure a crown on the implant, which will be matched in shape and color to the rest of your teeth so that it will look completely natural. While costs can vary depending on several factors, a good ballpark estimate is between $3,000-$4,500 for a single implant. Although implants may be more expensive initially, they last longer too! What Additional Procedures May Be Involved? While many people will be able to have a straightforward procedure done, it may be necessary to complete additional steps beforehand that can affect the total cost. Extraction – If you need to have a failing tooth (or teeth) removed prior to having an implant it will require more healing time prior to placing the titanium post. Bone-grafting – Conversely, if your tooth has been missing for quite some time, you may not have adequate bone mass to “hold on” to an implant. Bone-grafting is a procedure that can restore your bone to the levels necessary to maintain an implant. Implant-retained bridge or denture – If you’re missing several teeth or all the teeth in one arch, you may need work above and beyond the implants themselves. There are many ways that implants can be customized to fit your situation and your dentist will be able to review all of your choices. Dental implants are an investment in yourself that can last a lifetime with basic maintenance and care. It’s an excellent replacement option that feels so natural you may forget that you ever lost teeth to begin with! Dr. Thomas C. Dolan and Dr. Brendan Dolan are a father and son team who are committed to providing their community with the best dental care possible. Combining their compassionate chairside manner with the latest in modern dentistry, they can restore the smile and confidence of anyone who has lost their teeth. If you have any questions about the implant process they can be reached through their website or at (860) 529-2000. Comments Off on Thinking About Dental Implants in Wethersfield? Start Here!